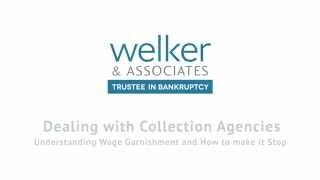 Dealing With Collection Agencies and Wage Garnishment | Welker & Associates Inc.
Chris Welker discusses wage garnishment and explains how you can make it stop. How can I get a collection agency to stop calling? If you owe money to your creditors and do not make payments your creditors may take legal action against you. The result of this legal action is something called a judgement. A judgment is a court order that allows your creditors to deduct payments directly from your wages and to seize assets. Anyone that doesn’t receive employment income and doesn’t own property. E.g. : people receiving pension income (disability, CPP, OAS etc.). These people are often referred to as being “creditor proof” or “judgment proof”. Just because creditors may not be able to garnishee your wages does not mean you’re free of creditor harassment, it simply means that your creditors cannot collect money from you by legal means at this time.